Although UmiDigi still can’t deliver its current flagship S3 Pro and its cheaper brother F1 Play, the manufacturer has already introduced another smartphone. The UmiDigi Power is set in the lower middle class and wants to be a long-distance runner with a large rechargeable battery without being too heavy in terms of thickness and weight. UmiDigi promises a relatively slim and visually appealing case in black or gold with a thickness of 8.8mm and a weight of 190g. The size of the smartphone is relatively small at 157 x 74.5mm. Responsible for this is the display with reduced edges and “Waterdrop Notch”. It uses In-Cell LCD technology, has a resolution of 2340 x 1080 pixels and a diagonal size of 6.3 inches. Typically for UmiDigi, the power should also score points with good equipment for the price. 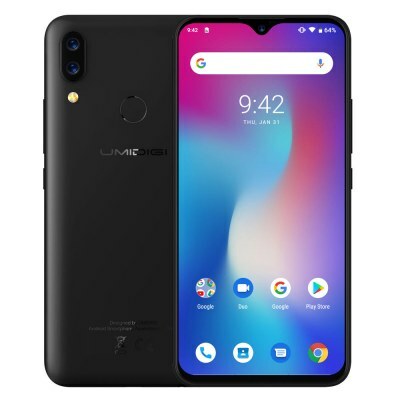 This includes details like NFC and global frequency support, Dual SIM, a Micro SD Slot (Hybrid) and a 3.5mm connector. Fast-charging is also a must with the large 5.150mAh battery. This works wired with up to 18 watts. Android 9 Pie is used as the operating system without any deeper adjustments. In order to achieve a particularly good battery life with the large battery, UmiDigi consciously relies on a somewhat weaker processor, the Helio P35 from Mediatek. It is located in the lower middle class segment and achieves about 86,000 points in the Antutu benchmark. The Helio P35 is manufactured with 12nm and offers 8 ARM Cortex A53 cores with up to 2.3GHz as well as a PowerVR GE8320 GPU. In addition, the chip offers KI acceleration. However, the UmiDigi Power will probably not make use of it. The memory equipment includes 64GB data memory and 4GB RAM. A rear dual camera with 16MP main and 5MP second sensor is available for photos. The main sensor has a fast f/1.8 lens with a 6-piece lens. The front camera resolves with 16MP and offers an aperture value of f/2.0. Videos can be recorded with a maximum of 1080p and 30fps. However, the highlight of the Umidigi Power, as the name suggests, is its battery. It has a capacity of 5,150 mAh and should therefore guarantee a long battery life. Nevertheless, it is quickly recharged, as the smartphone supports Fast Charging with 18 watts. The whole thing is only weighted down – 190 grams are not exactly little even today. 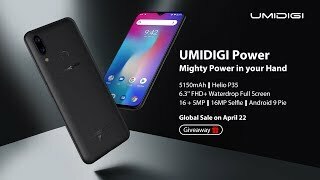 The UmiDigi Power should be available at a price between $159.99 and $189.99. According to UmiDigi, the smartphone will be available from 22 April. Delivery will start at the beginning of May. Whether the date can be kept, is questionable with view to the S3 Pro and the F1 Play however. UmiDigi will start the sale via its own Aliexpress store. There you will also get a 1-year warranty for the smartphone, which is backed by the alliance. In case of problems with the order or the device, the handling is made much easier.